*Please note that we do not charge bereaved parents for our products or services. If you are a parent who has experienced a loss, and wish to receive any products on the Dreams of You Shop page (excluding t-shirts and ribbons), please fill out the request form below and click submit. Due to the number of requests we receive, we do ask for parents to cover the shipping costs. This helps ensure we can continue to provide beautiful items to bereaved families free of charge. While we do our best to fill orders in a timely manner and try to help fill urgent needs quickly, please allow at least 8wks. for delivery in most cases. For Perinatal Hospice Families or families we support locally immediately following a loss ONLY, we also offer baby gowns. 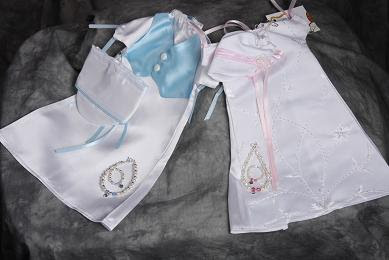 If you are currently carrying a baby with a fatal diagnosis to term, you may order a boy or girl gown. Please specify size or gestational age in notes on the order form if you are in need of a gown. The Dreams of You Memory Book was created in 2004 and revised in 2008 for mothers and families who have lost a baby. This book comes in an 8 by 11 ½ inch hardcover, antique leather bound-look binder format so it is easy to add or change the book to match a parent’s unique beliefs, tastes, and wishes. It includes places for parents to journal the dreams they had for their baby, their journey of loss and healing, letters to baby, pages to record the baby’s statistics, memorial service, baptism, footprints, mementos, etc. Also included are inspirational poems and comforting scripture from the Bible, as well as the author’s personal story of loss, grief, hope and healing. These beautiful, cream-colored, soft fleece Comfort Bears were created by Kathy Rutter in 2005 for grieving mothers to have something to hold to ease the ache of empty arms. Kathy created each one with a grandmother’s love and prayers. After a valiant battle with cancer, Kathy went home to heaven in October of 2006. Today her legacy continues as the Helping Hands Ministry gathers to sew the bears, sending a grandmother’s love and prayers along with each one. This newly adapted version of the Dreams of You Memory Book was created especially for families experiencing the loss of a baby prior to 20 weeks. Beautiful poems, comforting scriptures, and places to write the memories, dreams, and hopes parents have for their precious babies are within the pages of this keepsake. For our Perinatal Hospice Families ONLY: We now offer beautiful burial gowns for the precious babies who leave this earth too soon. Depending on what we have in stock, gowns are satin, linen, crocheted, or other materials and varieties. Gowns are donated by volunteers, so we cannot guarantee a certain style. Quantities are limited. Therefore we cannot provide a gown just for the sake of having a memento, and not actually being used to clothe the baby. Sizes range from a baby 10 inches to a full-term newborn size. The back of the gowns are open for easy dressing. The gowns are also excellent to have at the hospital for precious photograph keepsakes of baby and family. PAIL Remembrance Rosette Ribbons Now Available! 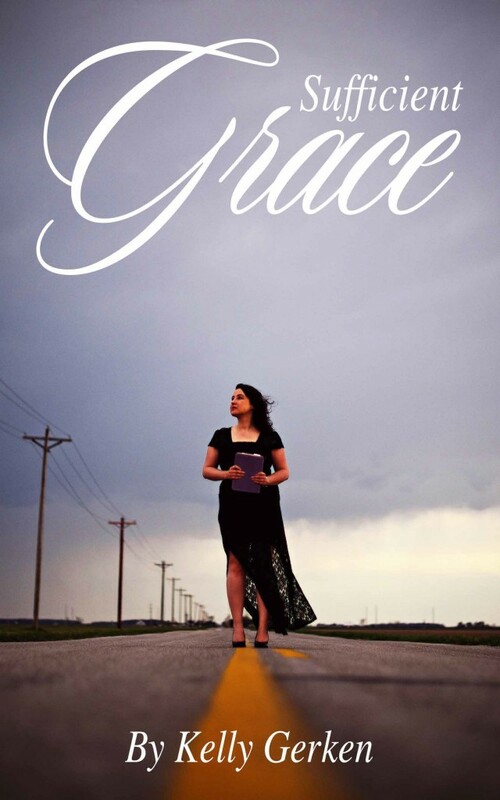 Proceeds benefit Sufficient Grace Ministries. 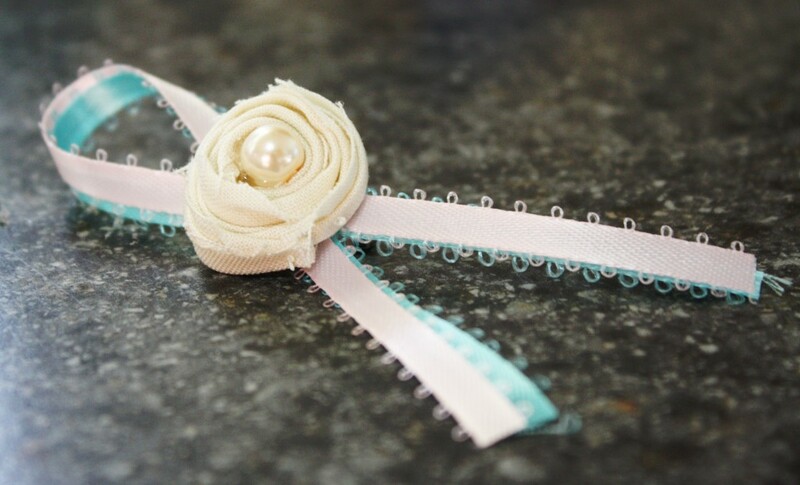 Click on the button below to donate $5 to receive your beautiful ribbon made by our very own Holly Haas. These ribbons are a special way to honor our babies in heaven, and to bring awareness especially during the month of October. Order yours today!